Pictorial Card Covers 10 x 7 inches tall, Lavishly illustrated with Old B&W Photos throughout. A county which can justifiably claim to be the birthplace of the Industrial Revolution, Lancashire was also, as a result, one of the first in Britain to develop a comprehensive railway network. As soon as local entrepreneurs worked out that the two perfectly complemented each other, the railways and industrialisation developed in tandem. This new history of the county's railways tells the story of the heyday of the Victorian Age, and also the slow decline from the 1920s to the Beeching era of the 1960s, and features fifty superb period photographs. 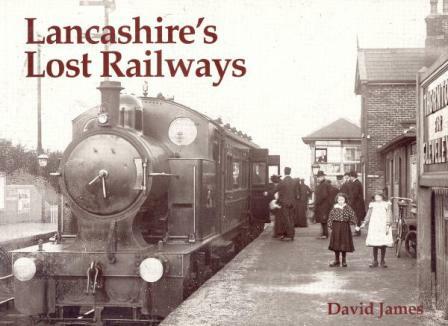 The locations illustrated include: Blackpool Central, Greenfield, White Bear, Gillett's Crossing, Wrea Green, Bradley Fold, Bolton Great Moor Street, Pennington, Kenyon Junction, Holcombe Brook, Tottington, Brinscall, Feniscowles, Delph, Knott End, Preesall, Garstang & Catterall, Great Harwood, Glasson Dock, Halsall, Ashton-in-Makerfield, Oldham Werneth, St Helens Central, Middleton Junction, Morecambe Euston Road, Bare Lane, Heysham Harbour, Oldham Clegg Street, Park Bridge, Skelmersdale, Longridge, Ribbleton, Grimsargh, Fleetwood, Bacup, Walkden Low Level, Hesketh Bank, Hutton & Howick, Haslingden, Lancaster Green Ayre, Caton, Hornby, Wigan Central, Bickershaw & Abram, Worsley and Thornton-for-Cleveleys.